Denver, Colorado. 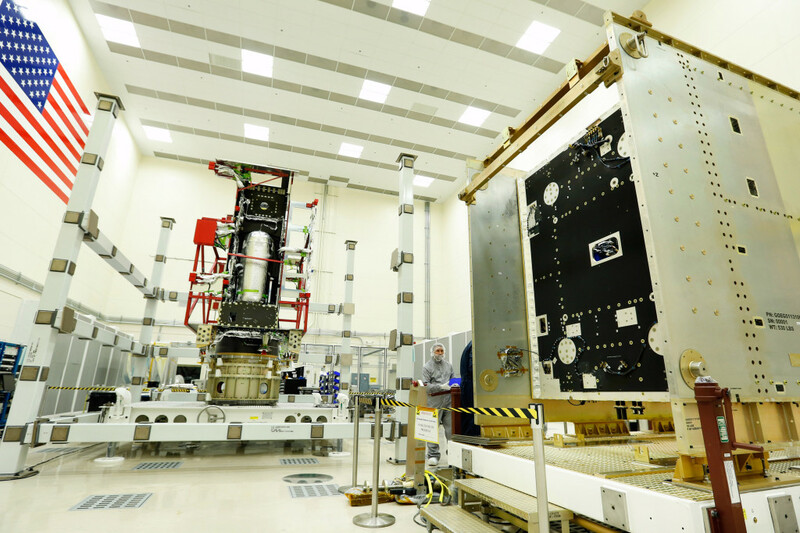 May 1, 2014 – The two large modules of the first GOES-R series weather satellite spacecraft were delivered to a cleanroom at Lockheed Martin’s Space Systems facility near Denver. The Geostationary Operational Environmental Satellite-R series (GOES-R) is NOAA’s next-generation geostationary weather satellites. With the delivery of the system module and the propulsion module, the weather satellite will now undergo the important integration and testing phase so that it can be available in late 2015 for a launch in early 2016. “The arrival of the propulsion and systems modules in Denver represents a significant milestone for the program. We are looking forward to the initial power up of the combined modules in a few weeks,” said Tim Gasparrini, vice president and program manager for the GOES-R series at Lockheed Martin Space Systems Company. The system module of the A2100-based satellite was built at Lockheed Martin’s Newtown, Pennsylvania facility. It houses the three major electrical subsystems, Command and Data Handling, Communication, and Electrical Power. The propulsion module recently underwent integration of its engines, fuel tanks and various propulsion components at the company’s Mississippi Space and Technology Center on NASA’s Stennis Space Center. Once the system module and propulsion module are mated in July, the spacecraft will move onto the payload integration, functional testing and environmental testing phases of the program. Data from NOAA’s GOES satellites provides accurate real-time weather forecasts and early warning products to NOAA’s National Weather Service and other public and private sectors. The advanced spacecraft and instrument technology on the GOES-R series will vastly improve forecasting quality and timeliness, generating significant benefits to the U.S. and Western Hemisphere in the areas of public safety, severe weather monitoring, space weather prediction, ecosystems management, commerce and transportation. In addition to four satellites in the series (R, S, T and U), Lockheed Martin is also designing and building the Solar Ultraviolet Imager (SUVI) and the Geostationary Lightning Mapper (GLM) instruments that will each fly aboard each of the spacecraft. The SUVI was recently installed on the GOES-R satellite’s sun pointing platform. The NOAA Satellite and Information Service funds, manages, and will operate the GOES-R series satellites. NASA oversees the acquisition and development of the GOES-R spacecraft and instruments for NOAA. The program is co-located at NASA’s Goddard Space Flight Center in Greenbelt, Maryland.